I'm an asparagus lover. I love it's earthy, distinct flavor that lends itself to many dishes. Most of all I love it made simply. If there's a little real butter or olive oil slathered on it, topped with a little garlic and salt, I'm in heaven. Here's a simple recipe that kicks the asparagus up a level and compliments it nicely. Mix all ingredients for dressing together and let it set overnight. Do not refrigerate. Marinate the asparagus in the dressing for 10 minutes. 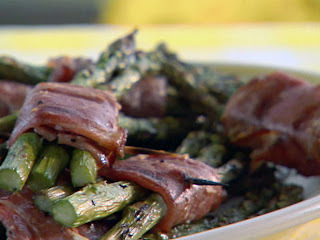 Wrap 2 to 3 asparagus with prosciutto. Serve on a bed of lettuce with tomato wedges, if using, and spoon dressing on top.